As we’ve been telling you in these articles, we expect sales to trend downward once official numbers were released, and that is the case. We still have some pretty good numbers though, and as you can see by the chart, the 2nd quarter of 2010 is the 2nd highest on record. 2009 was the highest on record. We’re still topping 2005 levels by a large margin. Home sales fell 12% in June over last year, down from 1,705 last year to 1,501 this year. Last month sales were 1,460, so we actually picked up a few sales. Single family home prices were also up about 10% over last year. Median price this year is $96,600 in June compared to $87,900 last year. Prices were roughly even in May 2010, so prices pretty much held steady. So what does all this mean? We have seen an increase in phone calls lately and an increase in buyer activity in the higher price ranges. This is a departure from last year when buyers only wanted the bargain basement homes. Buyers in the higher price ranges still want value and are not willing to overpay by any means, but at least activity is picking up. This can be attributed to the higher priced homes coming down in value and entering the buyer’s radar screen on where they perceive values should be. Buyers don’t always have a realistic view of what properties are worth, just as many sellers don’t. The exciting time in the market is when buyers and sellers perception become closely aligned. It is precisely then that transactions can occur. We would have more transactions occurring if more sellers could afford to sell. Many sellers just owe too much to sell at these bargain prices. Of course, if more sellers could afford to sell it would add inventory, so the market has a way of balancing itself out. Some buyers have backed off because they lost out on the $8,000 tax credit. The interesting thing is, rates were 5.5% back when this program was in effect, so by waiting, a buyer would now save $54,612 in interest on a $200,000 loan. Not bad for waiting just a few months. Will we ever see interest rates this low again? Will we ever see home prices this low again? Will we ever see them this low again together? I think the answer may be No to questions 1 & 2, and definitely NO to #3. Never before have we seen this much buying power in the market, and perhaps this is why home sales are still hanging tough. If you‘re a buyer, their really isn’t a better time to buy than now, and that is a fact! 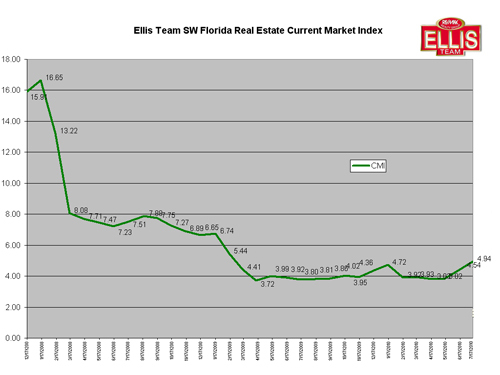 It’s been a little while since we released the official SW Florida Real Estate Current Market Index. This index accurately predicts the near term forward direction of the local real estate market by analyzing current market activity against inventory levels and assigning a value. A lower index level indicates a hotter the market, and a higher number indicates a cooling market. As you can see, the forward indicator heated up in February and we witnessed strong sales since that time. We have noticed a slight cooling trend since May. As we write this article official numbers haven’t been released yet, but we have spoken with several agents and loan officers who have also indicated a cooling trend since May. At 4.94 the index still boasts very strong numbers; however the trend has been rising lately so we’ll want to keep an eye on it. One reason the market has cooled a bit is because bargain based foreclosure property inventory levels have fallen off which has cooled buying demand. SW Florida has been a price sensitive market and buyers are off the fence and buying because they perceive real bargains. The looming question has always been what will buyers do when the real bargains begin to dry up? We have heard reports that banks will be unloading more foreclosures to the market soon, and already we are seeing that. Banks are not filing new foreclosures at the pace they once were, so we wondered how this could be true. The answer may be that the banks have not released the entire inventory they foreclosed upon in the past few years. To give an example, we just pre-listed a bank foreclosure we’ll be bringing to the market soon. From the time an agent receives a pre-listing it can take 1-6 weeks or so before property is ready to bring to market. Several reports, valuations, and decisions must be made, and in some instances repairs, water hookups, etc before the property is ready for market. This particular property had suffered some fire damage. The bank of course wanted a fire report from the fire department once they learned this new fact. Keep in mind, the banks don’t know what they’ve got on their hands until the appraisal and agent reports inform them. We obtained the fire report and determined the fire occurred back in 2007. It’s obvious the borrower has not lived in the property since 2007, and presumably hasn’t made a payment on a damaged property they weren’t living in. So the question is, if the buyer wasn’t making payments, why did it take from 2007 until now for the bank to foreclose and/or bring the property to market. The bank is just now discovering there was a fire over 3 yrs ago in the property. The answer is either the banks have held back inventory, or have just been too busy working their backlog. So just because foreclosure filings have been down in the past year doesn’t mean there couldn’t be more ready to hit the market. In addition to the banks we’re dealing with, we’ve also been working on FNMA listings. We’ve been told by various sources to get ready for an influx of FNMA properties as well, and already we’ve been assigned several pre-listings. Banks have been more diligent on short sales, but they’re still not quick enough. Short sale closings have been rising, but they’re still a drop in the bucket compared to the struggling homeowners out there. With short sale closings rising, and the possibility of more bargains hitting the market, we could see the index drop again, but for now it is rising and we’ll want to monitor. Nationwide sales have slowed, so it’s not just a SW Florida trend. We’ll be watching sales volume and pricing trends closely in the coming weeks and update you. Tune in to The Future of Real Estate Video Show. Posted in SW Florida Bank Foreclosures. 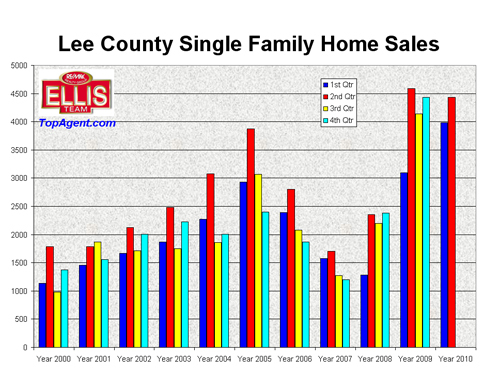 In addition to providing data on the SW Florida real estate market, we thought it would be nice to highlight some local Lee County communities and explore what is happening in that neighborhood today. This week we’ll focus on Reflection Lakes. 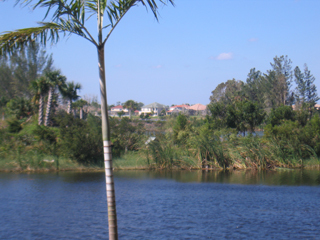 Reflection Lakes is conveniently located in south Fort Myers and boasts scenic lakes, special nature preserves, street lighting, community sidewalks and underground utilities all bordering pristine Lakes Park. The magnificent clubhouse sits on a lake and features a state of the art fitness center, billiards, administrative rooms, catering kitchen, heated community pool, children’s playground, 4 lighted tennis courts, basketball courts, sand volleyball court and a putting green. Reflection Lakes is very close to Barbara B. Mann Performing Arts Hall, and is close to the beaches, US 41, and features easy access via Summerlin Rd. Currently there are 30 properties for sale priced from $114,999 to $750,000. None on the market now are foreclosures. There are 4 pending sales currently priced from $134,900 to $329,900 and 3 of the 4 pending sales are foreclosures. Because Reflection Lakes was built primarily in 2002-2003 before the boom in real estate sales, there wasn’t a lot of speculative investor activity, and this is why we haven’t seen a large concentration of foreclosures like we’ve seen in newer communities in 2005-2007. There are some foreclosures and short sales due to the downturn in the economy, as is normal throughout SW Florida. So far in 2010 there have been 15 closed sales priced between $113,100 for a condo in Reflection Lakes to $350,000 for a single family home in Las Palmas, often referred to as the Estates II section of Reflection Lakes. This was a 4 bedroom, 3 bath home with 2,659 square feet of living area, a 3 car garage, pool and was lakefront. All of the active, pending, and sold listings are posted at www.ReflectionLakes.com The floor plans are also provided, along with a site plan. Maintenance fees for the single family homes are $159/mo and this includes cable TV, alarm monitoring, clubhouse, exercise room, pools, street lights, sidewalks, and all the amenities. Reflection Lakes even has it’s own TV channel for happenings and events inside the community. A fact most people don’t know is Reflection Lakes has a private entrance into lakes Park. It’s not uncommon to see residents ride their bikes or take walks into Lakes Park, or enjoy kayak and canoe rides into the park as well. The amenities, low HOA fees, floor plans, community activities, and superb location make Reflection Lakes worth looking into for buyers today. The community offers condos, town homes, villa homes, all the way to large estate homes, so there is a product to suit many lifestyles. Many people are surprised at just how much home they can afford these days, and with interest rates at all-time lows, now may be your chance. 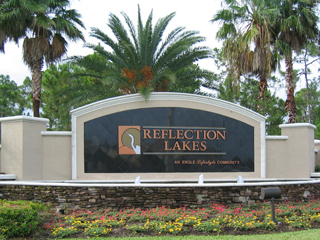 Reflection Lakes is a gated community, so you’ll definitely want to call a Realtor to look around. Good luck, and happy house hunting. 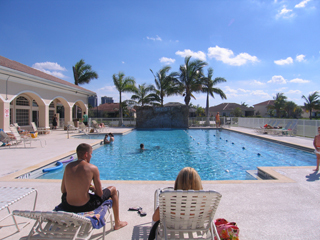 Posted in Fort Myers Real Estate, Reflection Lakes, Southwest Florida Real Estate.